"Soufflés are the most finicky dishes to make and bake." "Did you know that if you talk above a whisper while a soufflé is baking that it will collapse?" "Don't even think about walking near the oven either, or you are asking for trouble." You guys, these are all lies. Soufflés tend to get a bad rap, but, in truth, they are not as fussy as their reputation makes them seem. Sweet and savoury, big and small, soufflés are gravity-defying, impressive dishes that need a slot in your regular baking rotation. Made from a creamy, rich base of flavoured egg yolks, whipped egg whites, and a bit of magic, soufflés are fairly versatile and appropriate for any occasion. You might be thinking of individual chocolate soufflés with warm, gooey centers served at the end of a fancy dinner party, but today we are going simple and savoury - the kind of soufflé that finds its spot on a casual weeknight. In either cake, the signature soufflé "puff" is swoon-worthy while the light, creamy baked custard just melts in your mouth with every bite. Savoury soufflés are the ultimate comfort food - especially when made with cheese. If you have eggs, then you are already half-way to dinner. Pair a savoury soufflé with a simple salad or hearty bowl of soup and you are good to go! You get all the benefits and natural goodness from the eggs (nutrients like vitamin A, iron, and protein), while filling your belly with something warm and substantial. When a grilled cheese just won't do, treat yourself to a savoury cheese soufflé! Even though soufflés require several eggs (they play a big role not only in flavour but structure - more on this in a bit! ), they do not taste egg-y. I was inspired by both creamy and hard Italian cheeses, so it was a no-brained to add in some Italian herbs like fresh basil, thyme, rosemary, and parsley. The fontina cheese that I selected was slightly nutty and melted beautifully into the egg custard, while the parmigiano reggiano added a bit of sharpness. I added some shredded, mild provolone for a bit more depth, as well. So what is it about soufflés that makes them so intimidating? Probably the whipped egg whites. However, once you overcome your fears and learn how to properly whip and fold egg whites, it really is not all that scary. The yolk-enriched base provide flavor and richness, but the key players are the proteins in the egg whites. When whipped into billowy soft peaks then folded into the eggy, cheesy custard base, they provide the necessary lift in this light yet velvety dish. All of the tiny air pockets that are created as the whites are whisked expand with the heat of a hot oven as the soufflé bakes, making is rise and puff up in the most dramatic way. Preheat oven to 375 degrees Fahrenheit. Place the rack on the lowest setting in your oven. Grease the inside of an 8-inch round baking dish with butter and sprinkle with some of the grated parmigiano. Shake the cheese around until it coats the inside of the baking dish. Set aside. Heat the butter in a medium saucepan until melted. Whisk in the flour and salt. Continue to cook until you form a roux and the mixture is thick and paste-like. Meanwhile, heat the milk until it is just warm, then whisk it into the flour mixture. Remove from heat. Whisk the egg yolks until they are pale in color and slightly begin to increase in volume. Temper them into the flour/milk mixture by mixing in only a little bit at a time in order to gradually increase the temperature of the yolks without scrambling them. Stir in the cheese until melted. Fold in the herbs and set aside. Gently but deliberately fold in the whipped egg whites into the cheese mixture. Transfer the mixture to the baking dish and clean off any drips from the edges. Use an offset spatula to smooth out the top. Bake in the pre-heated over for about 35 to 40 minutes. When done, the top should be golden and there should be a bit of movement left when gently "jiggled." Soufflé waits for nobody! Both when you are making it and when you are trying to serve it, time is of the essence. Be sure that your oven is completely pre-heated before whipping the egg whites. Also, understand that the structure of a soufflé is not strong enough to support the extreme "puff" it gets from the oven. As it it cools, it will eventually collapse. If you are looking for that wow-factor, be sure to serve right away. For maximum volume, be sure your egg whites are room temperature and free from yolks. Also, be sure that your mixing bowl and whisk are clean, dry, and free from grease. Use a soufflé dish, ramekins, or something that is round and has higher sides than its diameter. Be sure to clean up any drips from transferring the batter into the dish, or the drips may bake faster and inhibit maximum lift from the soufflé. I recommend baking the soufflé on top of baking sheet just in case the cheese mixture spills over the baking dish. The Almighty Egg Eggs have always had 14 important vitamins and nutrients including protein, iron, and vitamin A. Natural goodness, brought to you by your local egg farmers. Ever since my husband and I decided to have children, I've been curious to see how my cooking point of view might change and/or evolve. We always try to eat healthy-ish (ie. balance out all the sweets I make for work with fresh produce and homemade dinners), but when it comes to feeding my little man, only the best will do. Now that he is eating more and more meals with us every day, I find it easiest to create healthy meals that the whole family can enjoy. Yes, there are subtle substitutions (Baby H only has a couple teeth, after all), but instead of trying to make two totally separate meals (one for us and one for baby), we are exploring the world of baby-led weaning. In other words, finger foods! While it takes nearly an hour some days for Everett to complete his meals, I really enjoy taking the time to sit down and eat a balanced meal. The company is always great, too. One of the easiest ways for Everett to get his protein is with eggs. He has a hard time with chewing meats and since he can't survive off almond-butter alone, eggs have always been the answer. He likes them scrambled, baked up into a frittata with veggies (we call them his "egg-fingers"), and even hard-boiled. He likes the hard-boiled best, because he can easily feed the pieces to himself. For me, I love my eggs runny. Luckily, it is so easy to whip up a meal of boiled eggs that suites us both. One of my favorite things about runny egg yolks is being able to dip toast into them. Toast soldiers, especially. For extra spice and flavour, I like to dip my egg-soaked toast soldiers in dukkah, an Egyptian seed and spice blend. Made with coarsely ground hazelnuts, sesame seeds, toasted coriander, and cumin, dukkah is typically served with bread and olive oil. 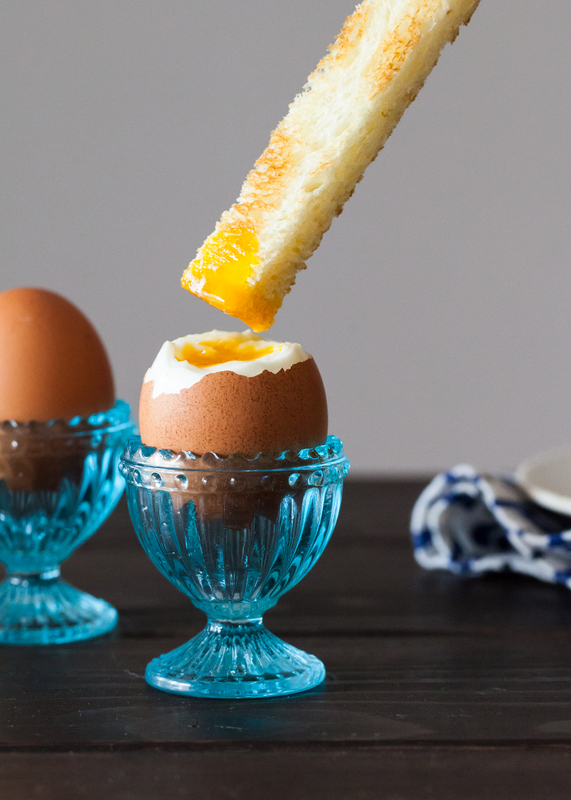 For breakfast, adding a soft-boiled egg to the mix makes for the perfect meal for mom. Bring a medium saucepan of water (about a few inches) to a rolling boil. Turn down the heat and bring the water to a heavy simmer. Immediately, carefully lower cold eggs into the simmering water and cook for about 6 to 8 minutes. Rinse under cool water for 30 seconds. Begin as you would with the soft-boiled eggs, but continue to cook for about 10 to 12 minutes. Toast the coriander and cumin until fragrant. Blend all of the ingredients together in the food processor until coarse. Mixture should still be very dry and not turn into a paste.